Our Millimeter Wave Circulators are the most advanced on the market today. We use sophisticated impedance matching and mode controlling techniques to provide the widest bandwidth in the industry. 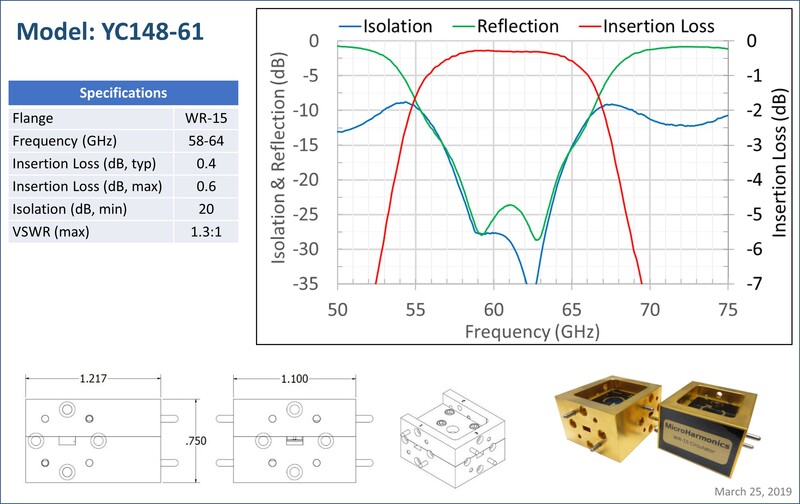 We currently offer a limited selection of Millimeter-Wave Circulators in the WR-15, WR-12 and WR-10 bands (50-110 GHz). These components are listed in the Table above. Below 50 GHz it is possible to tune Y-junction circulators to work over full waveguide bands (eg. 26.5-40 GHz). However, at mm-wave frequencies, these components are limited to fractional waveguide bandwidths. Throughout the industry, Y-junction circulators are typically specified with fractional bandwidths near 1-2 GHz in WR-15 and 1 GHz in WR-10. Using sophisticated impedance matching and mode controlling techniques we have been able to achieve more than a 200% increase in the bandwidth at these frequencies. For example, in the WR-15 band our YC148-60 circulator has a 6 GHz bandwidth from 58-64 GHz which covers most of the international unlicensed band (57-64 GHz). We don’t use any complicated dielectric matching elements. Rather, all of our impedance matching circuitry is implemented through precision CNC machined features in the waveguide block which are highly repeatable and tightly controlled. The machined structures also make it easy to align the ferrite cores with some precision and obtain a high degree of uniformity between the three circulator ports. Our initial offerings are targeted to bands where there is currently widespread interest in the millimeter-wave and microwave community. Over time we will continue to add products tuned to other sub-bands within the 50-170 GHz window in response to customer requests. Please contact us to discuss how we can apply our capabilities to your requirements. 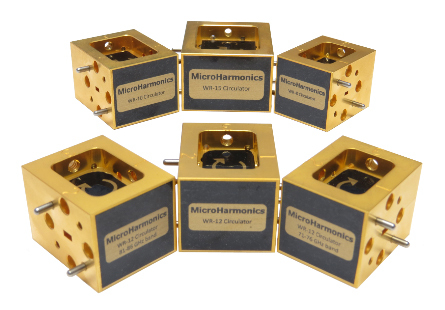 Micro Harmonics started developing millimeter-wave ferrite devices in 2012. We were convinced that the performance of the commercial isolators and circulators could be greatly enhanced through the use of modern electromagnetic simulation tools that we had been using for the development of state-of-the art millimeter-wave and terahertz varactor and varistor frequency multipliers. Our initial prototype Millimeter Wave Circulator (mm wave circulator) was designed to operate at 160 GHz in WR-5. The measured test data and the simulation data are shown in the graph to the right. The data are in good agreement with only a 1.5 GHz shift in the center frequency. This result affirmed our ability to accurately simulate and build these ferrite components. The measured insertion loss (solid red curve) is higher than the simulated data (dashed red curve) because the simulations did not include any waveguide losses. The bandwidth is about 2% of the center frequency when defined as the band over which the isolation and input return loss are both greater than 20 dB. At 161 GHz the isolation is greater than 36 dB and the input return loss is greater than 40 dB. The bandwidth at this frequency is close to the best reported on the commercial market. The WR-5.1 Millimeter Wave Circulator employed a triangular ferrite core. These were difficult to machine and subject to chipping on the vertices. We decided to change to a cylindrical ferrite core and to put more emphasis on broadband design. The WR-15 Millimeter Wave Circulator was our first attempt with the new topology. It employs no dielectric matching elements. There are only three parts; a waveguide block, a cylindrical ferrite core and a neodymium magnet for bias. All of the impedance matching and mode controlling elements are machined into the waveguide block. This makes the performance highly repeatable from one assembly to the next. Alignment of the ferrite in the block is trivial as there are machined features to ensure proper alignment. The graph shows good agreement between the measured and simulated data for the WR-15 circulator. 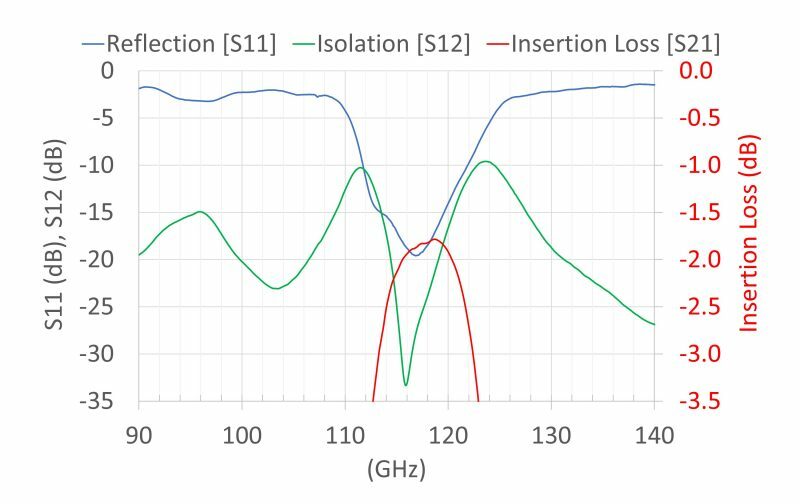 The insertion loss is about 0.3 dB across the 58-64 GHz band. The 20 dB bandwidth (the bandwidth over which the isolation is greater than 20 dB) is 6 GHz from 58-64 GHz. This is slightly less than the 7 GHz bandwidth predicted in the simulations. The discrepancy arises from some initial miscalculations in the ferrite material parameters. At this point, to achieve the full 7 GHz bandwidth requires a slight redesign of the waveguide block. We are currently prototyping a WR-8 Y-junction circulator designed to cover the sub-band 115-120 GHz. Some initial results are shown in the graph below. We have found that the WR-8 circulator is sensitive to small changes in the ferrite dimensions which can significantly degrade the performance. Small changes in the ferrite dielectric properties from one batch to another can cause similar problems. We are developing methods to gain tighter control over the ferrite core fabrication process. These sensitivities will temporarily limit our circulator development efforts to frequencies below 170 GHz.